Getting tired of all the easy puzzle games out there? Maybe you have a higher difficulty expectation for puzzle games, and today’s app market just doesn’t seem to have any game that fits your competitiveness? 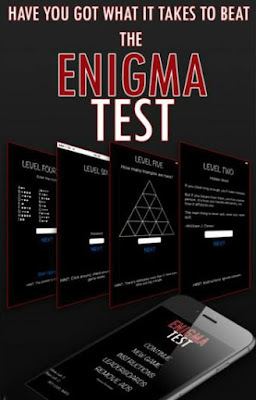 Well you’re in luck, because we just found out the new best puzzle app game on the market, and its name is Enigma Test. Enigma Test is the most addictive puzzle game that anyone has invented. It challenges you to think outside the box, and solve logic puzzles in tons of different levels and layouts. It has a variety of logical levels, testing and challenging your brainpower like no other. The difficulty starts of easy, but as you progress through each individual level, it gets even harder. Thanks to its abundance of puzzle payouts, you can never know which type of puzzle you will get in the next level. From figuring out the correct set of numbers, to cracking codes and tracking clues, this game will fill your time like no other. So what are you waiting for? 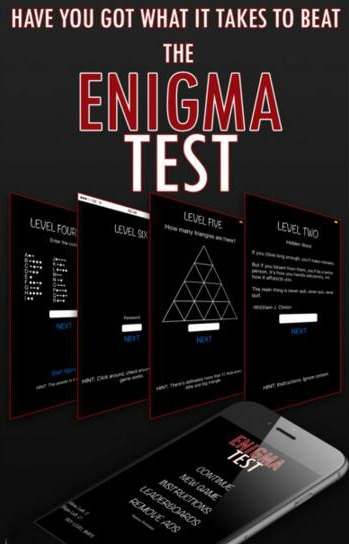 Download Enigma Test for free and challenge your friends and family in a friendly competition! If you’re interested in the game, you can find and download it for free from the App Store.